Random House, 2017. 194 pages. The newest book by Brené Brown didn’t hit me as hard as her earlier books. This may well be that although I know I have a problem with perfectionism (so The Gifts of Imperfection was perfectly appropriate), I already have strong roots of community in my life, especially through my church, but also a wide-ranging network of friends. 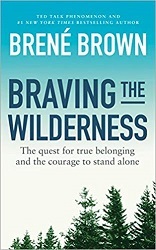 Braving the Wilderness is about True Belonging – yet at the same time about having the willingness to be authentic, even when it means standing alone. Her tips on finding this weren’t as pithy as in some of her other books. In fact, a few months ago, one of my colleagues came back to work after going to a class and was talking about it. I don’t remember much about it except that they used a very long acronym BRAVING, and I thought it was not only unmemorable to have such a long acronym, but I also thought that using V for Vault – to mean not betraying confidences – was a pretty silly stretch. (My co-workers and I thought Vegas would even be better, as in “what happens in Vegas stays in Vegas.”) So imagine my surprise to see that same acronym in this book. Now that I’m looking at the acronym, I see that she first introduced it in Rising Strong. (I didn’t remember that.) But now since “Braving” is part of the title, it was a little more central, and used as a checklist for trusting others and trusting yourself. The acronym stands for: Boundaries, Reliability, Accountability, Vault, Integrity, Nonjudgment, and Generosity. She does have some good points when she talks about the need to come back together as a society. I agree that we’re in a place where we need that. So here’s the big question: Wouldn’t you think that all of the sorting by politics and beliefs we’ve been doing would lead to more social interaction? If we’ve hunkered down ideologically and geographically with people who we perceive to be just like us, doesn’t that mean that we’ve surrounded ourselves with friends and people with whom we feel deeply connected? Shouldn’t “You’re either with us or against us” have led to closer ties among the like-minded? The answer to these questions is a resounding and surprising no. At the same time sorting is on the rise, so is loneliness. There are chapters titled with all four of these suggestions. And it’s good stuff – but it didn’t really stick in my mind. However, I did like what she had to say about True Belonging at the front of the book. Belonging to ourselves means being called to stand alone – to brave the wilderness of uncertainty, vulnerability, and criticism. And with the world feeling like a political and ideological combat zone, this is remarkably tough. We seem to have forgotten that even when we’re utterly alone, we’re connected to one another by something greater than group membership, politics, and ideology – that we’re connected by love and the human spirit. No matter how separated we are by what we think and believe, we are part of the same spiritual story. I do like the way she connects true belonging with standing alone. If you’re just trying to be like everyone else, you’re working on fitting in, and that’s very different from true belonging. But if you are vulnerable enough to show people who you really are – then you’ll be able to find true belonging. Again, this book might have hit me harder if I were feeling lonelier and didn’t have true community in my life. As it was, it reminded me that even though I live alone, I really do have people in my life with whom I truly belong. And that was a nice thing to remember. This entry was posted on Thursday, September 13th, 2018 at 10:59 pm and is filed under Nonfiction Review, Personal Growth. You can follow any responses to this entry through the RSS 2.0 feed. You can leave a response, or trackback from your own site.